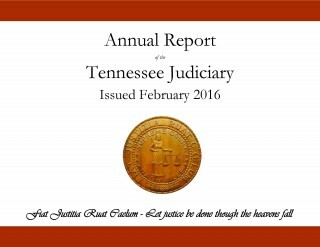 The Tennessee Judiciary has released its 2015 Annual Report. Below is Chief Justice Sharon Lee's introductory letter to the report, which is available in full here. As Judges, we see people at difficult times in their lives. They are involved in a disagreement with a neighbor or a business partner. They stand accused of a crime or are the victim of a crime. They are settling the estate of a departed loved one. They are having domestic troubles. In all these situations, people look to the courts to resolve their problems and they trust us to render fair and just decisions. We are committed to serving Tennesseans by applying the United States Constitution, the Tennessee Constitution and the laws of this state and rendering a decision based on the law and facts of each case. Working closely with the executive and legislative branches of government, we maintain the proper balance as the third branch of government and strive to make Tennessee a great place to live, work, and raise a family. We are dedicated to providing the highest level of services to Tennesseans. We believe that everyone deserves meaningful access to our system of justice. Justice is for all – not just those who can afford to hire a lawyer. We will continue to find ways to make legal representation available and affordable for everyone. We will take advantage of new technology to make our judiciary more efficient and effective. We will continue our review of the judicial branch to ensure that we are using best practices and being good stewards of our tax dollars. In 2015, we introduced a specialized court docket to handle complex business cases. Our veterans courts have been expanded to better serve those who have made sacrifices for us. We have laid the groundwork for e-filing in Tennessee courts. It is now easier for attorneys who are military spouses to become licensed in our state. We launched a task force to study the delivery of legal representation for indigent individuals charged with crimes. And we have undergone an extensive review of our case management practices and are working to improve the efficiency and timeliness of our dockets. I invite you to read more about these initiatives in the following pages. I am proud of what we accomplished in 2015. Looking ahead, we will continue to work hard every day to ensure the citizens of this great state are served by a court system that is fair, responsive, and efficient. The state of the judiciary is strong and will continue to improve in the coming year.